Blue Ridge Parkway is one of the more exciting destinations within the National Park Service’s purview. The scenery and wildlife make Blue Ridge Parkway a popular destination for campers, drivers, and RVers as well. Let’s look at the Blue Ridge Parkway including where to stay, what to do, and the best time to go so you can experience an unforgettable adventure along this national treasure. Under President Franklin D. Roosevelt’s administration, what would later become known as Blue Ridge Parkway was developed as the Appalachian Scenic Highway. Harold L. Ickes oversaw the development when work began in 1935. Congress authorized the project under the authority of the National Park Service shortly afterward. New Deal public works agencies funded much of the development and projects during the Great Depression. Few drives in the United States can be scenic and spectacular that they warrant becoming National Parkways under federal protection. That is the case for the gorgeous Blue Ridge Parkway. This stretch of road winds nearly 500 miles along the Blue Ridge chain of the Appalachian Mountains in both Virginia and North Carolina. Nicknamed “America’s Drive,” the Blue Ridge Parkway is the most visited part of the National Parks System, according to the National Park Service with over 15 million annual visitors making at least a part of the drive. Where you stay on your journey depends on what portions of the road you will be making your way through and what particular sites you’d like to see. There are several options for camping within National Park grounds along the parkway. The Mt. Pisgah Campground in the Flat Laurel Gap in Canton, North Carolina is a popular destination with 70 different RV sites. The grounds offer no electrical or water hookups so be prepared to dry camp. Camping at Mt. Pisgah includes to scenic hikes in Mount Pisgah itself as well as the Frying Pan Mountain Trails. If you’re making your way across the Blue Ridge Parkway in southwestern Virginia, I recommend the Rocky Knob Campground. While there are no electrical or water hookups, it is still a fantastic starting point for some of the most significant hikes along the parkway including the majestic rolling hills of the Black Ridge Trail and the thick forests of Rockcastle Gorge. There are also full-service RV parks and resorts along the way, including popular full-service chains, such as Jellystone Parks, and KOAs. I recommend using the lodging page of the Blue Ridge Parkway’s web site to find several available options. Since Blue Ridge Parkway encompasses such a vast area what you do depends on the particular region you’re staying in. The entire parkway does have similar activities. Hiking around the hundreds of trail adjoining the Parkway is the most popular pastime. There are also many museums, visitor’s centers, and a slew of other attractions dotting the Parkway in both states. My suggestion for coming up for your itinerary is figuring out region you will most likely find yourself in and start a search from there. Once again, the Blue Ridge Parkway’s web site does a great job of splitting the parkway into five distinct regions and provides attractions and itineraries for each of them. Explore their Suggested Itineraries page to make your schedule or get inspiration. Unlike many National Parks, Blue Ridge Parkway is extensive enough not to get crowded during the peak summer season. That being said, there are still certain areas that become more crowded during the season. Try traveling during the spring and autumn seasons to avoid some of these crowds. I urge you to travel the Parkway during the autumn to take in the spectacular foliage and changing colors. Winter is the best time to avoid crowds, but you risk different portions of the road closures due to inclement weather and hazardous road conditions. No matter what part of Blue Ridge Parkway you choose, you need to take a trip through the parkway at some point. 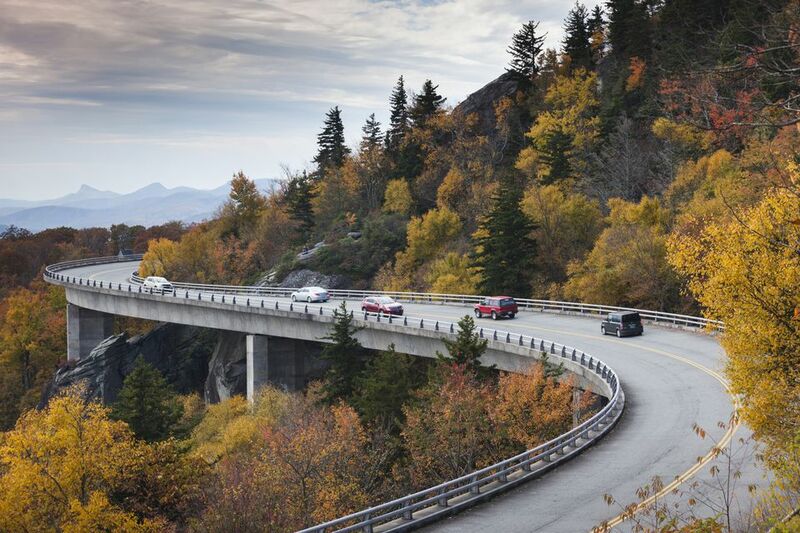 The winding road, scenic byways, and breathtaking views make the Blue Ridge Parkway perfect for RVers.